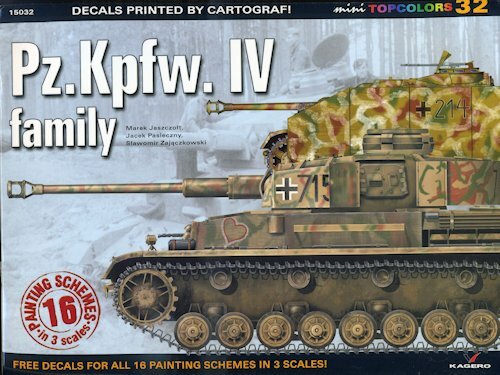 TopColors #32 is for the armor fan and specifically for the Panzer IV and variants. This set includes a total of 16 different vehicles. Like others in the series it is tough to categorize, but since it has decals in it, that is where I place it. Each of the 16 vehicles has a page devoted to it with a full page color profile and often with either detail images, a photo of the real vehicle or both included. Each one of these has a small history of the vehicles depicted in both English and Polish. Typical of the series, Kagero offers you decals for each one depicted. In this case, the markings are in 1/72, 1/48, and 1/35. They are superbly printed and I detected no issues with registration. 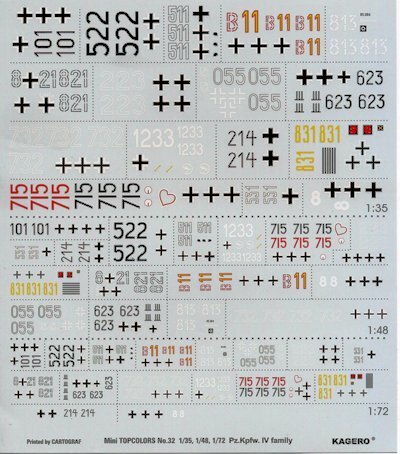 As armor is generally minimally marked, the dedicated panzer IV modeler, if using all three scales, could complete a whopping 48 models with this sheet. When you consider that the average cost of a decal sheet or a book alone, this one is a real bargain. Review book courtesy of the fine folks at Kagero. You can get yours at the link.